One of the hardest things about exercising is sticking with it. And, let's face it, a walk here, a bike ride there and an aerobics class once in a while isn't the stuff good, strong bodies are made of. But, if you can keep up your motivation for a couple of weeks, it will become a habit - and you'll really see and feel results. Timing is everything. Work out at a time that fits your schedule. If you plan to hit the gym after work, but often stay late at the office or have social engagements, it's going to be hard to make your workout a regular part of your week. For most people, mornings are the most realistic time. If you can get up an hour earlier for one week, you might find that exercise wakes you up and energises you for the rest of the day. Seek convenience. Pick a gym that's close to the office, so swinging by in the morning, popping in at lunch time or on the way home is super easy. Before you know it, your car will practically be steering itself there. Make it a 'given'. If you do work out in the evenings, make sure your friends and family know that other engagements will have to wait until after your exercise time. The more you and everyone else in your life becomes accustomed to scheduling around your workout, the less likely you'll be to blow it off for other activities. Think ahead. Half the battle is being organised. It doesn't take much. While you're packing your lunch or laying out your clothes for work the next day, be sure to pick out clean exercise clothes, pack your gym bag and fill up your water bottle so you can get up and go in a jiffy. Talk it up. Decide that you're going to be that person in the office or around the neighbourhood who is awe-inspiring for motivation. 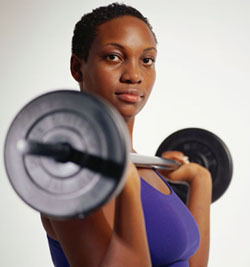 When co-workers start noticing your weight loss, tell them that you now exercise four to five times a week. Make it a character trait, a fact of life - not just something you've been dabbling in lately. Hearing yourself describe your life in this way makes it real - and will inspire you to keep it up. Enjoy it. The truth is, the feel-good chemicals released during exercise can leave you craving exercise. If you can reach the point where you yearn for that fitness high the way someone might desire coffee, motivation will no longer be an issue.